If you make an investment on a taxable investment such as fixed deposits, recurring deposits or company deposits then, in that case, the interest you earn is also taxed. The TDS will be deducted, when the interest is paid to the investor. This TDS amount can be adjusted at the time of paying yearly taxes or while filing income tax returns. Any institution will deduct TDS only when the interest income exceeds a specific limit. If your interest income is more than Rs. 10,000 a year then in that case the bank will deduct 10% TDS on the entire amount. The TDS limit for the interest income earned from company is Rs.5000. In Financial Year 2018-19, a new section 80TTB came into being, according to which a deduction of Rs. 50,000 is allowed with respect to the interest income from deposits held by Senior Citizens. 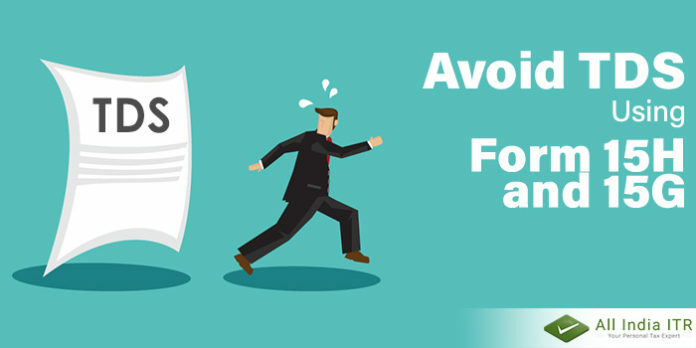 How you can avoid Tax Deducted at Source on your interest income? In order to avoid TDS on your interest income you will have to submit a declaration Form 15G or 15H. Form 15G is applicable for those who belong to the age group of below 60 years, whereas Form 15H is applicable for those who belong to the age group of above 60 years. A taxpayer can submit this form only when the tax on total income of the taxpayer is nil and the average of the interest received for a particular Financial Year is not more than the assigned tax slab, that is Rs. 2.5lakh for taxpayers under 60 years of age, Rs. 3lakhs for Senior Citizens and Rs. 5Lakh for super senior citizens. If you have paid excess amount as Tax Deducted at Source or in case you are eligible for non-deduction and your TDS has already been deducted, then you can claim refund while filing your Income Tax Returns. You can easily get access to All India ITR using Downlopad All India ITR’s IOS and Downlaod All India ITR Android apps. Not just this, you can also use our tax app, which comes handy to all the taxpayers. Previous articleWhat is section 194IB?